Pharmacy benefit managers (PBMs) are at the heart of the complicated supply chain that delivers prescription drugs from manufacturers to consumers. Lawmakers have begun to target PBMs' pricing practices, which sometimes result in higher costs for consumers. Three companies dominate the PBM market nationally. As prescription drug prices continue to soar, policymakers are searching for options to drive down consumers’ costs. Scrutiny of pharmacy benefit managers is emerging as one of those options. Pharmacy benefit managers (PBMs), once under-the-radar cogs in the pharmaceutical supply chain, have gained power over the past decade and now play a key role in pricing. Prescription drug spending in Colorado jumped 354 percent between 1991 and 2013. It was the fourth fastest growing category of health care spending in the state.2 Ten cents of each health care dollar in Colorado go to prescription drugs. Colorado’s lawmakers turned their attention to prescription drug prices and pharmacy benefit managers during the 2018 legislative session, passing one bill with little disagreement, although related bills failed. 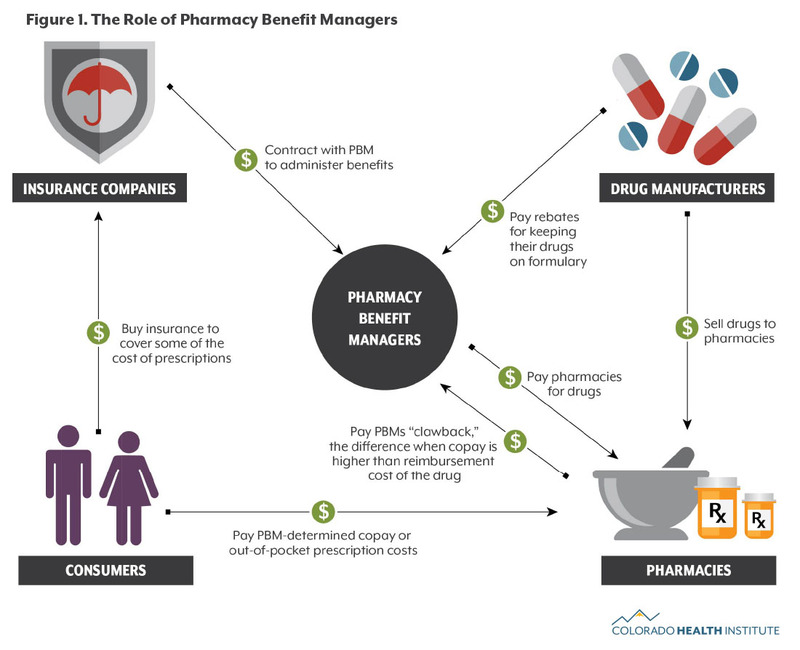 This paper explains how pharmacy benefit managers evolved, how they work and the implications of policy changes that might help to manage pharmaceutical costs in Colorado and across the nation. Pharmacy benefit managers are at the heart of what has become a complicated supply chain getting prescription drugs from the manufacturer to consumers. These firms sprang up in the 1960s, specializing in handling lots of relatively low-dollar claims. Many insurance companies soon contracted with them to manage their pharmacy services. Pharmacy benefit managers oversaw the prescription drug claims that came through pharmacies, set copayment levels for enrollees, and decided which pharmacies would be in-network. By the 1990s, pharmacy benefit managers had expanded their services to include negotiating with drug manufacturers for rebates, effectively opening a new stream of revenue. They also began offering services like mail order drugs, disease management plans for chronic illnesses, and patient monitoring for potential negative drug interactions. But it was in the early 2000s that pharmacy benefit managers entered their prime. The Medicare Modernization Act of 2003, which included implementing Medicare’s prescription drug benefit (Part D), provided a new market for pharmacy benefit managers: Medicare enrollees. At the same time, pharmacy benefit managers began consolidating, using their greater size as leverage to negotiate lower prices from manufacturers, promising to pass on savings to the insurance companies that were paying them. How much pharmacy benefit managers add to prices as drugs flow from manufacturers to consumers has become the focus of many policymakers. Pharmacy benefit managers grew based on their usefulness to insurers and their ability to leverage their larger scale for lower prices. But the current business model is raising red flags for some critics. Administrative Functions: Managing and paying for prescription drugs of enrollees is the foundation of pharmacy benefit manager revenue. The insurers pay a fee to the pharmacy benefit managers for this work. Drug Manufacturer Rebates: In exchange for including drugs in their formulary — a list of approved drugs — drug manufacturers provide pharmacy benefit managers with rebates. Critics say this practice sometimes pushes patients toward higher-rebate drugs, which tend to cost more.7 It can also push pharmacy benefit manager margins higher. Price Spreading: Pharmacy benefit managers also make money through a strategy called price spreading. PBMs negotiate lower prices with drug manufacturers but mark up the price when they charge insurance companies for individual prescription claims. This makes up about 10 to 15 percent of a pharmacy benefit manager’s revenue. Clawback: The pharmacy benefit manager sets the copay for patients filling a prescription at a pharmacy. If that copay is higher than the reimbursement cost of the drug, the pharmacy benefit manager can “claw back” that difference from the pharmacy that collected the copay. The pharmacy benefit manager business model has changed dramatically since 2002. 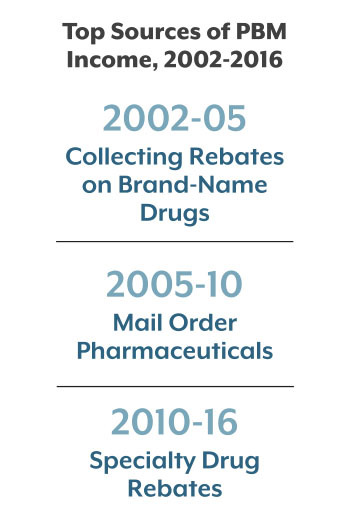 Between 2002 and 2005, most of a pharmacy benefit manager’s gross profits came from collecting rebates on brand-name drugs. From 2005 to 2010, their profits shifted due to the growing market for mail order pharmaceuticals. Since 2010, numerous specialty pharmaceuticals like those used to treat complex chronic conditions have entered the market and shifted pharmacy benefit manager profits. In 2016, about half of gross profits came from specialty drug rebates. The rebates and clawbacks, in particular, are drawing criticism. And many pharmacy benefit managers have issued gag orders, prohibiting pharmacies from alerting consumers to lower-price drugs, primarily to make money on the clawbacks.10 Pharmacists who break this gag order can face penalties and even removal from the pharmacy benefit manager’s network. Nearly 50 pharmacy benefit managers operate in the U.S., but the three largest — Express Scripts, CVS caremark and OptumRX — control 73 percent of the market share. Consolidation of pharmacy benefit managers and other health care players has created these three pharmacy benefit manager giants. And they’re only getting bigger. One of these giants, CVS caremark, is itself is the result of a merger between CVS pharmacies and the caremark pharmacy benefit manager group. CVS caremark recently acquired health insurer Aetna for $69 billion. Cigna, another health insurer, announced in March that it plans to acquire Express Scripts for $52 billion. Colorado does not regulate pharmacy benefit managers, so there is little data on their operations available. Health First Colorado, the state’s Medicaid program, contracts with Magellan RX to serve as the pharmacy benefit manager for its nearly 1.3 million members. The Virginia-based company is the Medicaid pharmacy benefit manager in an additional 20 states and the District of Columbia. Last year, more than half a million Coloradans did not fill a prescription because it cost too much, according to the Colorado Health Access Survey. This number has changed very little since 2009, the first year of the survey. This year, Colorado lawmakers and others put pharmaceutical prices in their crosshairs. Colorado and at least 29 other states took up legislation targeting pharmacy benefit managers. Colorado lawmakers voted to close the “clawback loophole,” which allows pharmacy benefit managers to place gag orders that prohibit pharmacists from informing their patients of cheaper payment options or alternative medications. This allows PBMs to recover excess copays from pharmacies. House Bill 18-1284, which went into effect on August 8, prohibits pharmacy benefit managers or insurance carriers from placing such gag orders. HB 18-1284 was sponsored by Reps. Janet Buckner (D) and James Wilson (R), and Sens. Beth Martinez Humenik (R) and John Kefalas (D) and passed overwhelmingly in both houses. Six other pharmaceutical-related bills failed to make it to the governor’s desk. These included several bills on drug price transparency, one bill which would have allowed cheaper drugs to be imported from Canada, and two bills which would have prohibited price gouging on prescription drugs. A bill to allow patients more freedom in choosing a pharmacy drew the attention of Express Scripts and CVS, which testified against it. It eventually died in the Senate Business, Labor, and Technology Committee. Colorado, like most other states, does not have regulatory oversight or reporting requirements for pharmacy benefit managers. Colorado lawmakers this year took a step toward addressing the powerful role of pharmacy benefit managers. CHI anticipates more attention will be paid to increasing transparency and addressing drug prices in the future. Ian Pelto joined CHI in the summer of 2016 as a Public Interest Fellow and served as a research analyst until 2018.